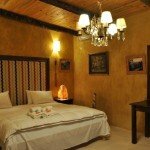 We also offer personal itineraries for shorter or longer stays. The estancia is open all year round. 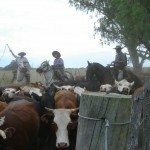 Included – All the riding, accommodation, meals, drinks including alcohol, gaucho activities (cattle moving, calves roping and vaccination, dehorning, branding, signaling or bathing the cattle. 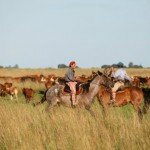 After the gaucho duties, it’s usual to share a good asado with the wood used to make fire and mark the cattle) & bird watching from horseback. Excluded – Flights, transfers, tips, additional activities such canoe trips, 4×4 trips, motorboat safaris, massages and polo lessons. Getting There – International flight to Buenos Aires. Transfer – By Air, it’s 2 hours to Goya Airport from Buenos Aires, plus 1 hour transfer by car to the Estancia. By bus, it’s 8 hours on a luxury bus with reclining seat, this is a good option to do overnight & highly recommended as part of the adventure. It takes you right into Esquina, the nearest town. 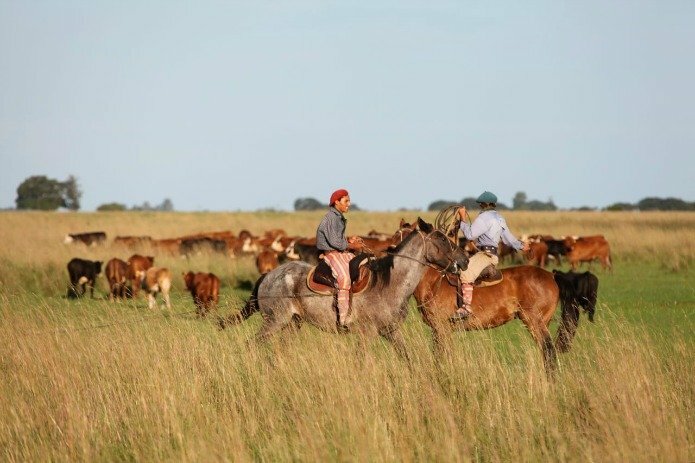 An authentic working cattle estancia set in Esquina, South West Corrientes Province, 6 hours North of Buenos Aires. 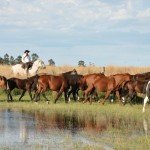 In 2007 Estancia Corrientes opened its doors to guests and invite them to experience traditional country life on a family estancia… the riding, wildlife, the food and Gaucho culture. 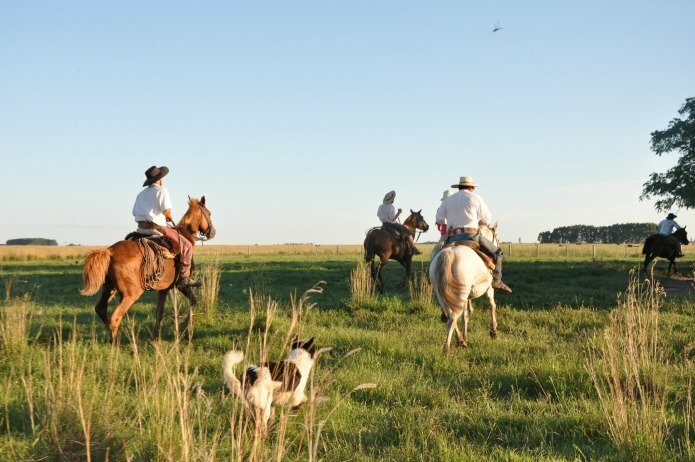 Every day at Estancia Corrientes is different and guests receive a tailor made programme to suit which may include exploring the countryside on horseback, bird watching, fishing in the River Corriente and learning some Argentinean gaucho skills. 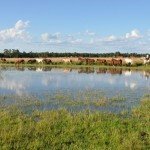 For those who simply want to chill out and enjoy the countryside there are plenty of places to relax and indulge in the delicious home-made food and fine Argentinean wines. 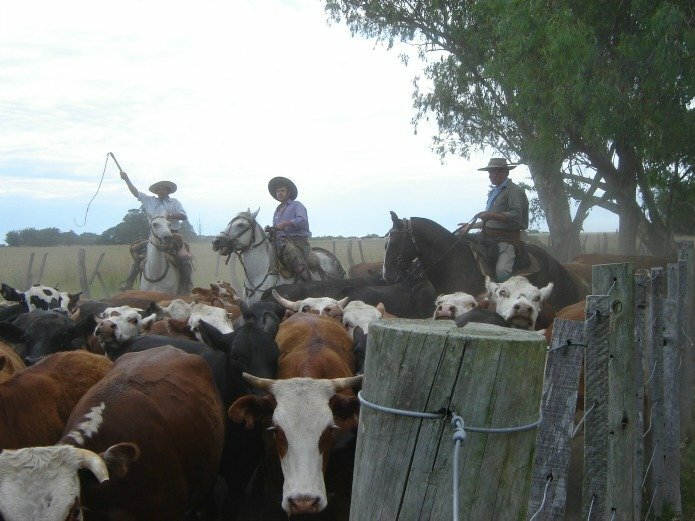 Angie and Diego Solanet own The Estancia and live there with their family. 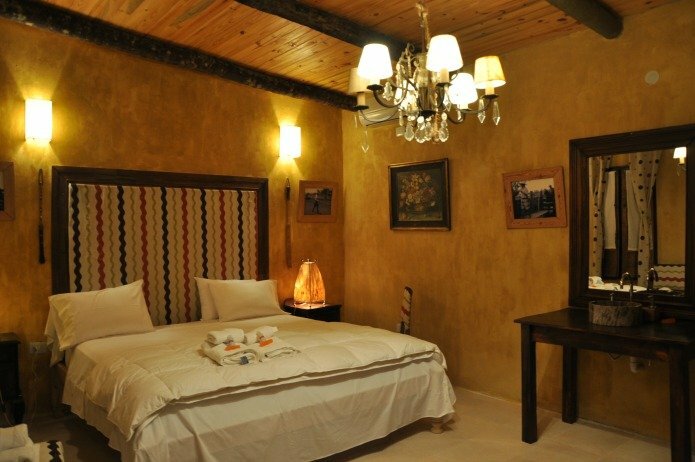 They warmly welcome guests as part of the family and enjoy sharing their country life and all its traditions. We learned to love the Correntinean countryside with its customs, traditions and the extraordinary force of its nature, thanks to our grandparents and our parents who passed this passion onto us from our childhood. We have the privilege of living in it with our children, following the trail our ancestors traced. Today we open its fence to share it with you. 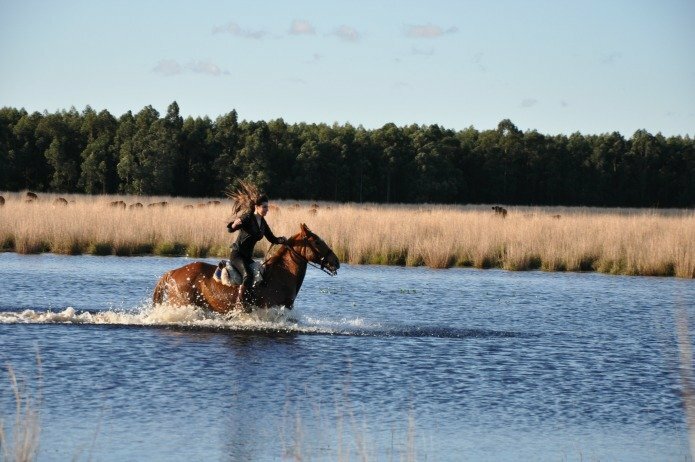 If you want to ride, take part in the varied rural activities or simply relax and enjoy the charming nature of the Correntinean countryside, we invite you personally to share some days with us. Tack – Western style riding with recado or montura correntina saddles, which are very comfortable and leather covered in sheep skin. Weight Restriction – 120kg / 266lbs / 19stone. Group Size – Maximum 8. 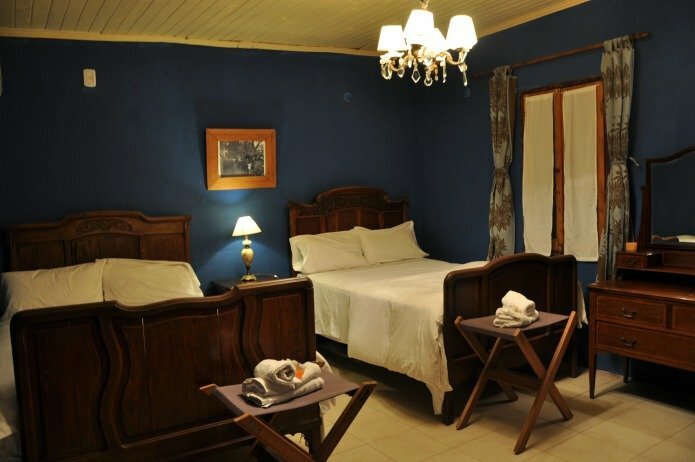 This original horseshoe estancia, renovated to include modern comforts in keeping with the traditional elegance can take up to about 24 guests at one time. 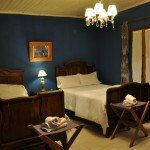 They have a mix of 12 rooms all with ensuite and individually decorated and each named after an Argentine bird. They also have large windows that take in the beautiful views out to the fields and wetlands. In addition, there is lots of communal space, two living rooms, three dining rooms, a play room for children, a pool house for barbeques, a bar and a swimming pool. Food – The food is wonderful, all homemade using organic produce from local farmers. A typical breakfast includes freshly baked bread, cereals and toasts, homemade jams and butter, scrambled eggs, cakes, coffee, tea, orange juice and fresh fruit. Mid-morning after riding, there are appetizers such as olives, cheese, salami washed down with the offer of a beer or a glass of Malbec wine. At lunch time, the BBQ is fired up there is lots of different meat cooked along with grilled vegetables and salads. Late afternoon, there’s time for a sundowner of local wines, gaucho bread (a grilled bread) and chipá (small bread with cheese) and variety of tea or coffee and cakes. And if you can make it to dinner, expect something of a European dish with and Argentinean twist. What’s lovely here is the kitchen is open to guests all the time and you are invited to watch and learn about the local cuisine, enjoying tastings as the cook prepares dishes! 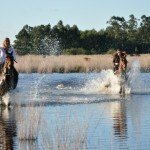 Also available at the ranch at an additional cost are Dorado Fly Fishing Tour, Wildlife Safari 4×4, Polo Lessons & Spa Treatments. Add ons – City Apartment stay in Buenos Aires, trip to see the Igauzo Falls. We will meet in Esquina city. We will then drive you from Esquina bus station to the Estancia (10 minutes) Early breakfast. This is our first day first experience saddling and our first ride with the gaucho. In the afternoon we are having a traditional asado. 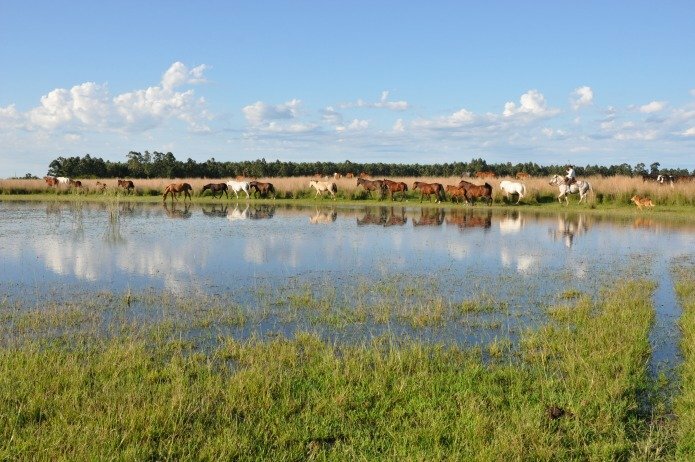 In the evening, we will depart from the estate and reach the shore of the Corrientes River. We will take advantage of the local trails to access the several islands that make up the delta of the river before it flows into the Paraná River. The place where the two rivers meet is quite interesting due to the contrast presented by the two different colours of the water. Once in the islands, you will be able to watch nature in its most wild state, with few footprints and no wire fences. Centuries ago these islands were inhabited by aboriginal cultures fond of fishing and hunting, they left behind ceramics that can usually be found. Flora and fauna are exuberant. 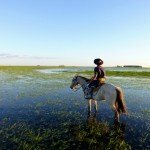 Then we return by horse to the estancia. Tea at the baranda. Dinner. Breakfast. We will spend this morning doing daily duties with the horses including cattle moving, calves roping and vaccination, dehorning, branding or bathing cattle. We will choose the activity according to the daily gaucho schedule. Lunch at the estancia. In the afternoon we will go out riding out on tracks where you will be able to see herds of horses and sheep. Immense lagoons with reservoirs will welcome you and you will be able to see the native fauna, otters, tortoises, capybaras (big local rodents), yacarés (local alligators), herons, flamingoes, storks, and dozens of bird varieties. 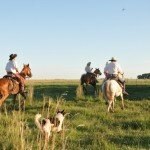 We will stop for an asado (barbecue) in the open country and will be back at the estate at dusk. Tea with homemade pastry. Dinner. Breakfast. Today we are ready to do the Open Plain horse ride. Departure from Don Joaquin. 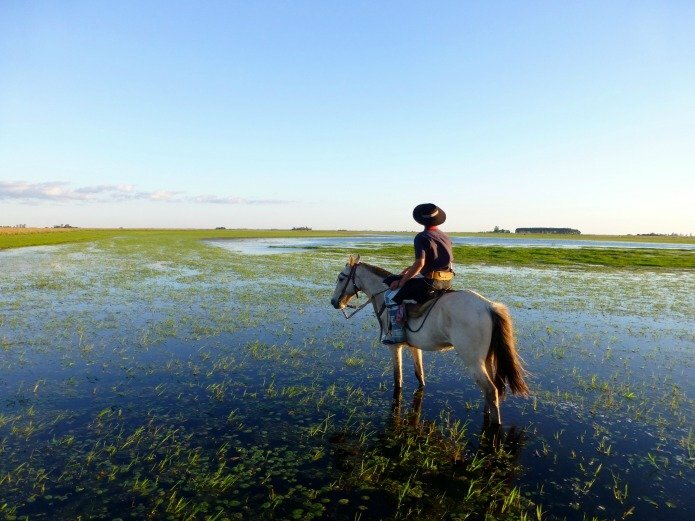 This ride allows you to discover the Argentinean plains with its immense lagoons, swamps and rich ecosystem. Lunch at the estancia. Siesta. Swimming pool. *Relaxing massage. We are ready at night to do the nocturnal horse ride. The nights when the moonlight allows, we are riding across the fields and enjoy the sounds of the night dwellers along with the Correntinean wide skies. Dinner. Breakfast. We’ll ride to the natural Correntinean scrubland. This ride allows the view of the diverse tree species and bushes of the litoral region, along with the 250 bird species. At times, the paths between the narrow flora cover branches to become arches or tunnels. Lunch at the estancia. This afternoon we will learn gaucho skills. (lasso and sortija)Wine tasting. Dinner. Breakfast. 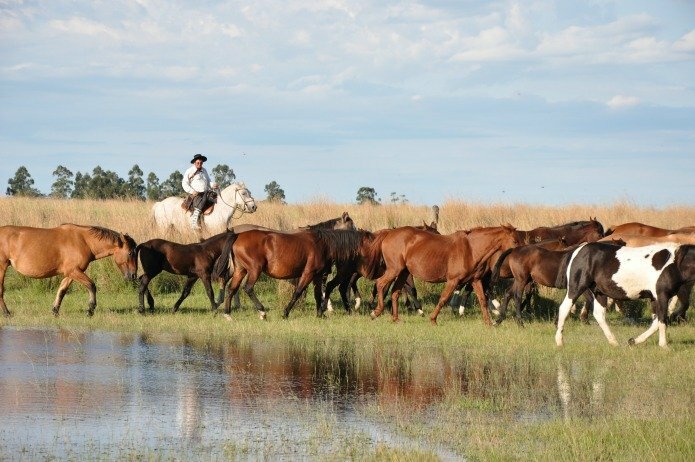 Today horses are ready to go from the Estancia to Horse Esquina town. We will have Empanadas (Argentinean pasty) in a local restaurant. 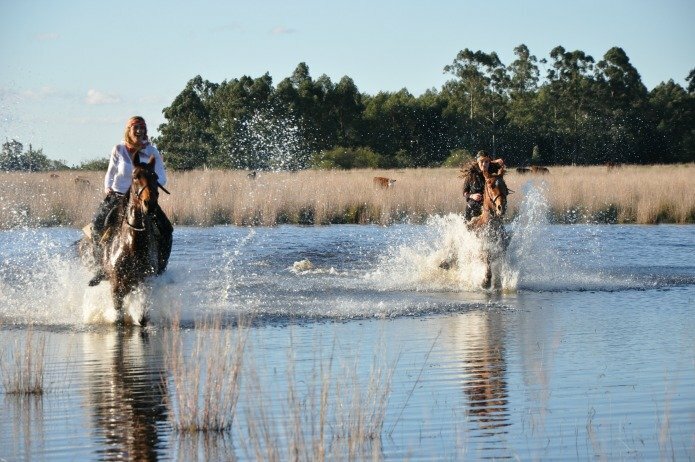 Return to the estancia by horse or *by motorboat to the estancia (15 minutes). Lunch. Siesta. *Polo lesson or and *relaxing massage. Tea at the baranda and mate tasting watching the sunset. Dinner. After breakfast. Wildlife safari on horse back. We will see capibaras, caimans and Rheas in our morning ride. 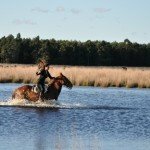 Ideal for photographic safari by horse. *Regional Cuisine cookery lesson. Lunch. Siesta. *Optional polo lesson or and *relaxing massage. Or the lagoon horse ride. Dinner. This is a big day! After a hearty breakfast we cattle drive with the gauchos. Asado at the estancia. Siesta. Visit to town. *Polo lesson. Cheese and wine tasting. Farewell Dinner. Transfer. Just a quick note to say thank you so much for arranging our trip. We loved the remoteness of Huechahue, it is the most 'incredible' place with such outstanding scenery. My highlight was arriving at the volcano crater after two hours of cutting through undergrowth with a machete. We both play polo, though not to a very high standard, and wanted somewhere nice to stay for a week that would serve both as a place to relax and a place to hone our polo skills. Put simply; we loved it so much, we arranged a special trip to return just four months later!